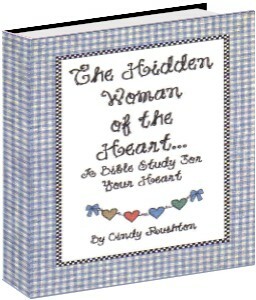 Introducing our HIDDEN WOMAN OF THE HEART BIBLE STUDY--NOW AVAILABLE as an E-Book!! We have been working away behind the scenes to publish our books in EBOOK format! NOW! We are elated to let you know that we have a NEW EBOOK!! If you have been praying for a Titus Two Mentor, this is YOUR book! If you have no idea what God's view of a godly woman really is, this book will surely answer your many questions! If you have been looking for a Bible Study that will dig deep, but is easy to fit into your schedule, you are SURE to LOVE this one!! Who? ME? A Virtuous Woman??? Just What IS a Virtuous Woman? Just WHAT Does God REALLY Think of You??? Marriage 101! Hey! What's This All About? A Call for Me and You! Instilling a Passion for God! What about Teens? MUST They Rebel??? What IS a Keeper of the Home? Do I HAVE to Stay AT Home? A Gentle and Quiet Spirit??? Spiritual Mothering...The Call to Mentoring, Mothering, and Ministry! Yes! YOU! A Vessel God Can Use! Becoming A Vessel God Can Use! OH! You will LOVE IT! buy one for yourself AND a friend! Just order BOTH for $37.00. Include email addresses for both recipients! You will bless your friend AND yourself!